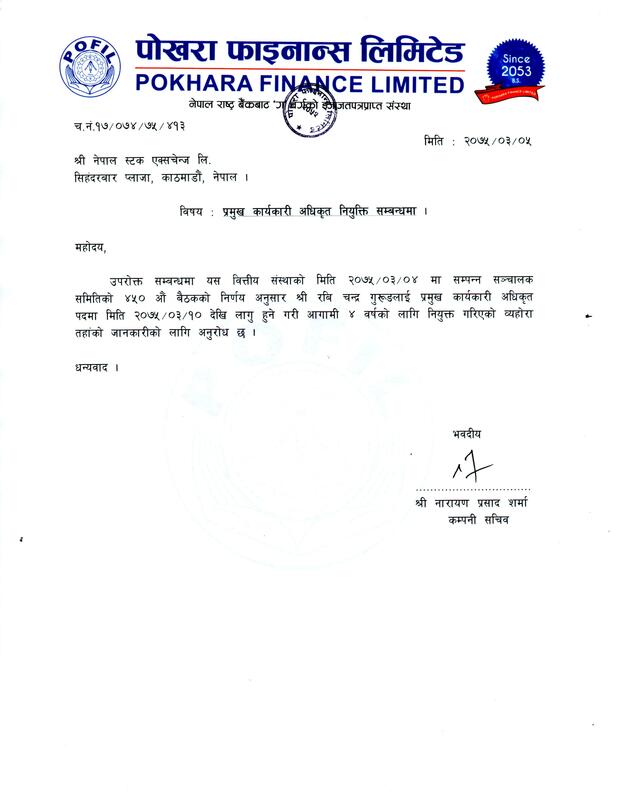 SGM of Karnali Development Bank Ltd.
News Title SGM of Karnali Development Bank Ltd.
Karnali Development Bank Ltd. has informed NEPSE on 2075-03-07 about SGM.For more details please find the company's letter. Book Closure and AGM of Mega Bank Nepal Ltd.
News Title Book Closure and AGM of Mega Bank Nepal Ltd.
Mega Bank Nepal Ltd. has informed Nepse on 2075-03-07 about Book Closure and AGM .For more details please find the company's letter. 40,27,966.20 Units Rights Shares of Asian Life Insurance Co. Limited has been listed. Listing of Rights Share of Neco Insurance Co. Ltd.
News Title Listing of Rights Share of Neco Insurance Co. Ltd.
39,20,928.11 Units Rights Share of Neco Insurance Co. Ltd.has been listed. 30,94,154.77 Units Rights Shares of Kamana Sewa Bikas Bank Limited has been listed. News Title Listing of Right Shares of Sindhu Bikash Bank Ltd.
5,35,301.4 Units Right Shares of Sindhu Bikash Bank Ltd. has been listed. News Title Listing of Right Shares of Central Finance Co. Ltd.
21,47,005.35 Units Right Shares of Central Finance Co. Ltd. has been listed. Listing of Rights Share of First Micro Finance Development Bank Ltd.
News Title Listing of Rights Share of First Micro Finance Development Bank Ltd.
22,81,313 Units Rights Share of First Micro Finance Development Bank Ltd.has been listed. Listing of Bonus Shares Nerude Laghubita Bikash Bank Ltd.
News Title Listing of Bonus Shares Nerude Laghubita Bikash Bank Ltd.
News Description 3,97,800 Units Bonus Shares of Nerude Laghubita Bikash Bank Ltd. has been listed. Book Closure and AGM of Deva Bikas Bank Ltd.
News Title Book Closure and AGM of Deva Bikas Bank Ltd.
Approval of Bonus and Cash Dividend from Nepal Rastra Bank . Board Meeting held on 2075/03/05 has appointed Director Mr Bhuwansingh Gurung as Chairman of Board of Director. Adjusted price for RADHI is Rs.261.82 for 10% of Bonus Share. Its Average Base Price is Rs. 180.91. 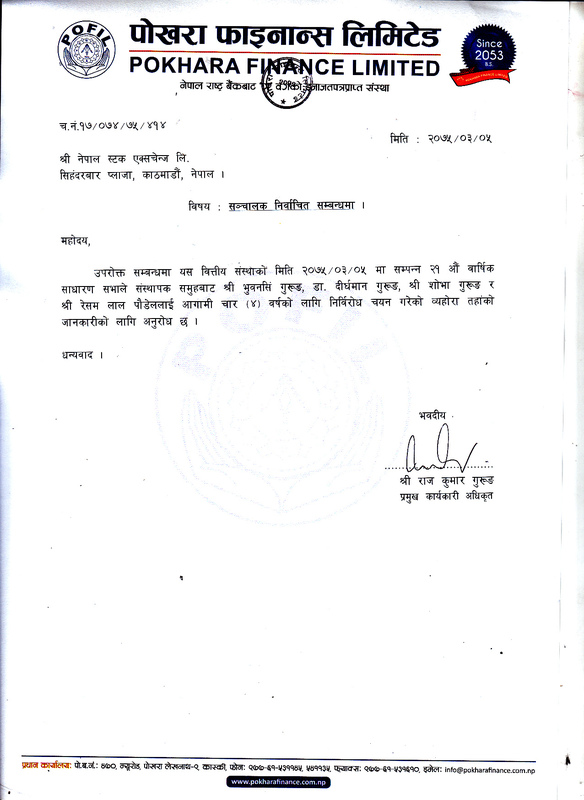 Sana Kisan Bikas Bank Ltd has informed NEPSE on 2075-03-05 about the book closure and SGM date. For detail information please visit our website and find company's letter. 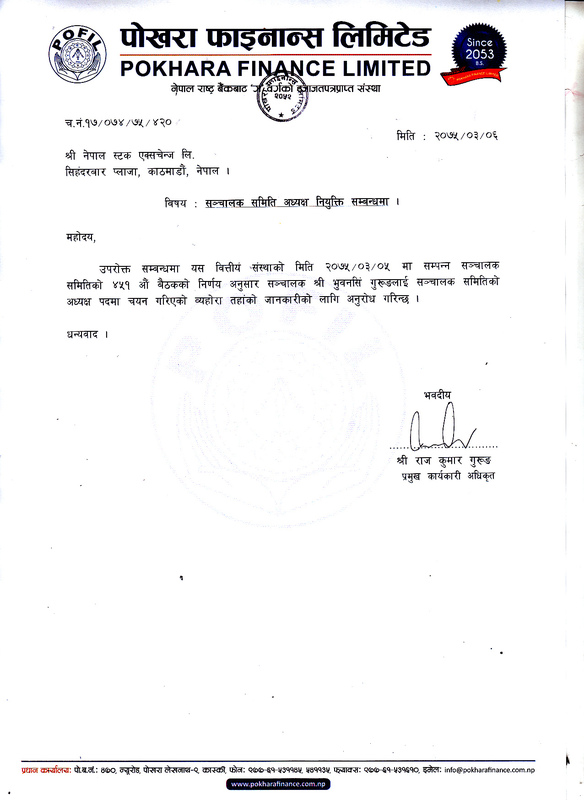 Book Closure and AGM of Nepal Hydro Developers Ltd.
News Title Book Closure and AGM of Nepal Hydro Developers Ltd.
Nepal Hydro Developers Ltd. has informed NEPSE on 2075-03-05 about the book closure and AGM date. For detail information please visit our website and find company's letter. Pokhara Finance Limited has appointed Mr Rabi Chandra Gurung as CEO with effective from 2075-03-10. Annual General Meeting of Pokhara Finance Limited held on 2075/03/05 has appointed Mr Bhuwansing Gurung, Dr. Dirgaman Gurung, M/s Shova Gurung and Mr Resham Lal Poudel as Director from Promoter Group for Four Years. Adjusted price for MFIL is Rs.122.98 for 5.71% of Bonus Share. Its Average Base Price is Rs. 136.49. News Description Adjusted price for SIFC is Rs.167.5 for 26.57% of Bonus Share. Its Average Base Price is Rs. 234.25. Adjusted price for SADBL is Rs.159.02 for 2.50% of Bonus Share. Its Average Base Price is Rs. 228.51.